When we got married, a good friend, who had more foresight than we knew at the time, gave us as a shower gift a lovely glass cocktail pitcher and two martini glasses. Over the years, it saw some use, but never on a regular basis. We drank plenty of cocktails, but I just didn’t make a habit of bothering to use the pitcher to mix and serve, etc. etc. Then, my husband got me hooked on MadMen, and I remembered the pitcher. Most of our glassware had broken, too, so I made a trip to Ikea because I decided that I absolutely had to have new high ball and low ball glasses. As in Caroline’s home, we’ve pretty much always honored cocktail hour. We buy Prosecco by the case in summer, and always have a couple of bottles on hand for guests, but we also enjoy a range of mixed drinks, depending on the season and the menu. And we also let our kids join in and frequently give them kid cocktails, which we serve in little flutes or the new glasses or the cool goblets which handle everything from everyday wine to more complicated mixed drinks. Generally, these involve a mixture of, say, bubbly water, Torani syrup, fruit juice, Italian sodas, and a fancy garnish. We don’t think we’re encouraging our kids to drink alcohol but we do think that we’re encouraging a social hour that involves something special and delicious and pretty. They know we drink alcohol and they don’t. They know that our cocktails and their soda (an infrequent treat) are something special. I like to think we’re encouraging a kind of ceremony, a winding-down time, a time for conversation, a pause in the day before dinner, a little refreshment to get us through the end of the day with some pleasure and a maybe a little grace. We eat padrones, or caper berries, or almonds, or olives, or edamame and wasabi peas…or nothing…whatever I have. But while the imbibing hasn’t really changed over the years (if anything, we probably drink less now than we did years ago), the aesthetics of it has, and this is due entirely to the MadMen spree I went on last spring and my friend’s gift. I took the pitcher out of the cabinet and started using it, a lot, and it really did change my life. When we were home on the weekends, out would come the pitcher and one of us would mix the cocktails, and I’d finish dinner, or we’d sit on our deck and while it really was the same as always, it was different. Nicer. More elegant. It made us stop and pay a little bit of attention to each other, which is important when you have children and busy work schedules and lawns to mow and a two-story playhouse to build in the back yard. This weekend, I made shaking beef for dinner and was looking for a cocktail to precede it. I had a bottle of sake, but I wanted a martini, and a quick google turned up several versions of the saketini, but we chose Bobby Flay’s because the greater sake to vodka version was more appealing. We used a lemon cucumber from the garden for garnish, and its flavor infused the drink in a deliciously cool and lemony way. It was pretty and perfect ice cold drink, and I can’t wait for an excuse to have another one. Then Kory wondered what a kids martini would look like. What is left, after all, when you take out the sake and vodka? He shrugged, pulled out two more martini glasses, and mixed away. 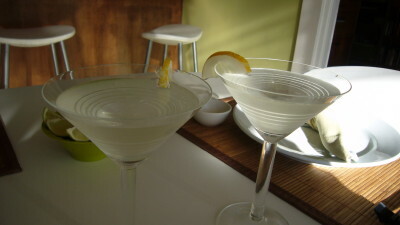 He added bubbly water, a little lemon torani syrup, and a pretty garnish. May I repeat? He’s good with the garnish. The kids gaped when they saw the drinks. “Whose is this?” Ella wanted to know. “FOR ME? !” Finn exclaimed. They were all wide-mouthed smiles, and Ella professed, “This is the Best. Kid’s. Cocktail. Ever.” But the thing is, it wasn’t anything she hadn’t had before, sans fancy glass and fancy garnish. It was just much, much prettier. And that made all the difference. My father has always said, all things in moderation, and I believe him. 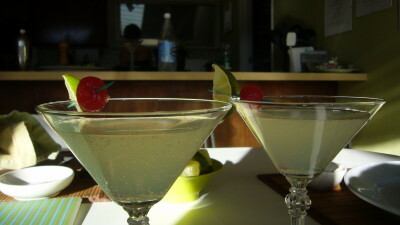 So Caroline and I are pledging to you a moderate number of cocktail-inspired posts over the coming weeks. For your own MadMen viewing pleasure. And beyond. Combine sake and vodka in a cocktail shaker with the chipped ice and shake well. Strain into a martini glass and garnish with a slice of Japanese cucumber. Chill soda water, then fill glasses 2/3 full with it. Add syrup to taste. 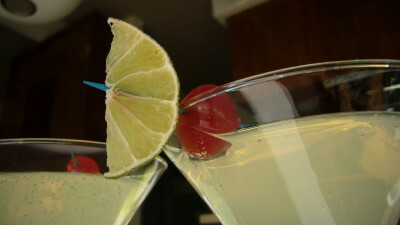 Put one lime and one cherry on a party-colored toothpick for garnish.